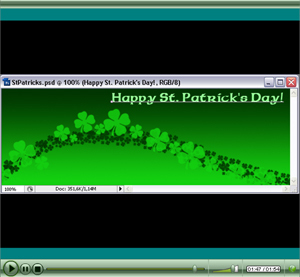 Graphics for St. Patrick's Day - Fast and Easy Way to do it! You are here: Home / Shop / Graphics for St. Patrick’s Day – Fast and Easy Way to do it! Graphics for St. Patrick’s Day – Fast and Easy Way to do it! St. Patrick’s is getting closer and closer. Many of you would like to spice-up your blogs, webs or other designs with some cool graphics for the occasion. Well, now is the chance. There is no faster and more efficient way of making St. Patrick’s day graphics than using St. Patrick’s themed Photoshop brushes. This simple graphics can be done in 1 minute and 52 Seconds. Enjoy some Irish music in this short tutorial video which shows you how it’s done. Great tutorial, the music caught me off guard so I couldn’t help but chuckle a bit when it started. I love this…thank you…I keep trying to learn new things as I am still relatively new to blogging and this is helpful. Awesome design, thanks for sharing! Silvia….last evening as I was focusing on my blessings, I realized that doing this tutorial was one of them. I had SUCH fun doing it!! The music was great and the creation was super. I just found my way to this site yesterday and already I’m hooked on it….THANK YOU!! Thank you Ginny! Your wonderful message is a blessing for me too 🙂 I’m so glad that you liked it!